Hmmm. Well, this disc can open a lot of cans of worms. You have seen these grey best of collections for artists, now they have greatly cheapened the product, I think it's a couple of bucks cheaper too. Like a digipak with a Styrofoam disc tray. No liner notes, just a URL to go and download them. Not even a pressed CD, a form of a burned CDR called a Diamond CD, it is a pretty silver piece of plastic. 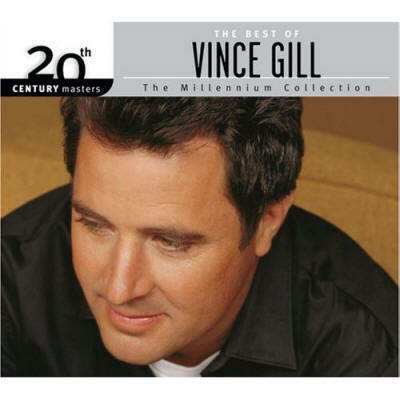 This collection of songs probably covers the high points of Vince Gill's Nashville career. OK, I slip this baby in the CD player and "wow" it sounds great, yeah, the thing that matters most, they did get right. It is in fact, remastered very well. I love Vince Gill, he was popular before Tony Brown talked him into coming to Nashville and being a country artist. He played and sang lead in the Pure Prairie League for a couple of years and also was playing with Rodney Crowell's band, those incredible Cherrybombs. "High Lonesome Sound" - What a great bluegrass sound from an album of the same name with Alison Krauss and Union Station. Incredible rendition, this is just a plain old audiophile quality recording, amazing sound field and stereo spacing. "Pretty Little Adrianna" - Only Vince Gill could fashion a ballad like this, sing it and play some ethereal lead guitar. Mmmm, Vince's guitar playin', fender thru a Boss CS3 into a Fender amp. "A Little More Love" - great mid tempo country rocker. These songs never sounded that good, I'll do without the liner notes, I'll take the sound quality. You know what is so good about this recording, is the separation, everything is so clear in the mix. I think that Vince brought out the best in guitarist Brent Mason, though some think that it was Alan Jackson. The ninety's were my favorite era for country music. "Feels Like Love" - an up-tempo love song, oh can Vince sing about love, what great lyrics, what great country music. "Next Big Thing" - What a great way to end this collection, Vince can tell that his time in the limelight is limited in country music, this comical sarcastic song pokes fun at the "Next Big Thing". Country music was country and hot in the ninety's. 1997 brought us the "Dixie Chicks", Wide Open Spaces was my favorite CD for over four years. I still love it. When Vince and Patty were abandoned by country radio, I turned it off. Then came 9/11/01, the country was attacked, The Chicks were abandoned because of Natalie's remarks. Toby Keith got mad, Big and Rich got rich, Gretchen Wilson joined the Nashville mafia. Brent Mason started playing with indie artists too. Reba got a TV show. I discovered Americana and Bluegrass music. Listening to this disc reminds me of better times in America. The innocence is gone, from high gas prices and falling stock markets to terrorism and global warming. Carrie Underwood can sing, but real country? That is your choice. I'll take Mindy Smith, Carrie Hassler and Hard Rain and Mountain Heart along with the other country acts that stay country.